After acknowledging that bullying Cuba for decades proved to be a bad and losing strategy, the U.S. changed course, but not entirely. 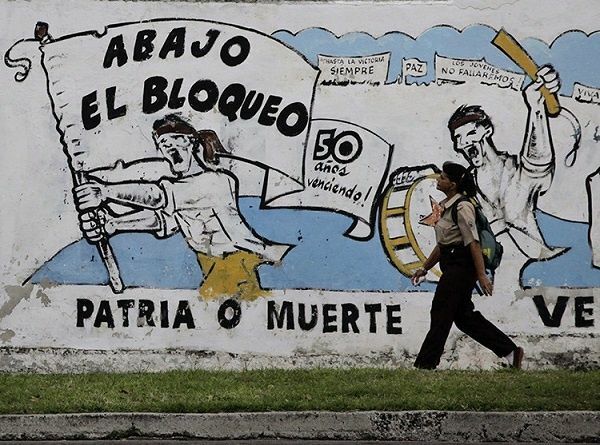 Many believe since U.S. and Cuba restored diplomatic relations, the blockade imposed on Cuba by the U.S. is over, but 55 years later, it remains in place. But despite this economic blockade and an international campaign by the U.S. to isolate Cuba from the world arena by trying to deny it health equipment, financial transactions, and even cultural performances and sports competitions, the socialist nation has kept its head high and shown the world it can advance no matter what the obstacles. After acknowledging that bullying Cuba for decades proved to be a bad and losing strategy and that, in fact, it had turned Latin America against the U.S., former President Barack Obama decided to announce a change in policy, reestablishing relations. It was historic — well, sort of. International media had its story: U.S. citizens could now buy Cuban cigars and rum and bring them back home. But, unfortunately, for the Cuban people, the blockade is far from over. During the last part of his second term in office, Obama announced he had begun negotiations with the Cuban government to reestablish diplomatic ties and begin the path to normalizing relations between the two countries. The first step was easing travel restrictions for U.S. citizens by setting up a system of licenses under 12 categories that would allow those who met certain qualifications travel to Cuba, but many restrictions remained. The government also reestablished commercial flights and allowed cruise ships to land in the island's harbors. Tourists were no longer limited to only taking US$100 worth of Cuban cigars and rum back to the U.S. Acknowledging Cuba’s top cancer research institutes, the U.S. also deregulated joint medical investigation and cooperation. Then came the opening of an embassy in each country's capital in 2014, the Cuban office in Washington, D.C., and the U.S. one in Havana. By 2016, the State Department removed Cuba from a list of states that sponsor terrorism, where it had found itself since 1982. The Department of Homeland Security ended the so-called 'Wet-foot/Dry-foot' immigration policy in January 2017, which was put in place more than 20 years ago. The Cuban government always maintained it was a provocation, encouraging illegal and risky migration by water and demanded its repeal. The policy allowed only Cubans — no one else from any other country — who reach U.S. soil an expedited legal permanent residency and eventual U.S. citizenship. The blockade. The blockade remains intact. A picture of Obama in 2016 in a historic visit to Havana, in front of the famous Che Guevara portrait at Revolution Plaza, wasn’t enough to ensure Cubans that the hostile blockade would be lifted. Obama assured Cuban President Raul Castro that the blockade would be lifted, but didn’t specify a timeline of when that might happen. Raul made it very clear that relations could never be normal until the U.S. ended the blockade, the largest commercial blockade in modern history. Cuba has also called time and again on the U.S. to return the naval-occupied territory of Guantanamo to the island and to respect Cuban sovereignty by halting all funding of anti-government groups and other organizations. But then, at the end of 2016, Obama renewed the U.S. Trading with the Enemy Act, extending the blockade against Cuba for another year. Under the current foreign policy in the U.S., Cuba can’t export or import from the U.S. Even if the island does acquire a permit to buy anything, the country is obligated to pay in advance and only in cash, in a different currency than dollars, and through bank institution from other countries. Medicine imports are conditioned, Cuba needs to specifically detail the final destination of medicine acquired, and once again it has to be done through third countries and in another currency. U.S. companies that export machinery and equipment, services, or technical information that are key to providing drinking water for Cubans and equipping hospitals are also prohibited from doing business with Cuba. The U.S. went even further and prohibited and threatened to sanction third countries if they sold products or services to the islands. Several professional players and sports team have denounced barriers imposed by the U.S. government against their participation in seminars, competitions, and practices on U.S. soil. U.S. citizens still can not use U.S. credit and debit cards while on the island and U.S. banks can not carry out any transactions to and from Cuba. The U.S. continues to limit the amount of money that individuals in the U.S. can send to families living in Cuba. According to a report given by the Cuban government at the U.N. General Assembly, the U.S. blockade costs the island nation US$4.7 billion in 2016 and a staggering US$753.7* since it began almost six decades ago. At the U.N. General Assembly, 191 of the 193 of the nations voted to condemn the blockade in 2016, as the majority have done for several decades. The difference in 2016 being that the U.S. and Israel abstained from voting for the first time since both nations have continuously voted against it. Now with the Trump administration overturning many Obama-era acts, the likelihood of any more concessions from the U.S. are unlikely. Rex Tillerson, the newly appointed secretary of state and former ExxonMobil chief executive, said that he would reverse, or comprehensively review, Obama’s executive orders. The Republican majority in congress will most likely follow suit. *According to Cuba’s 2016 report to the United Nations: "The economic damage caused to the Cuban people through application of the United States economic, commercial and financial embargo against Cuba, taking into account the depreciation of the dollar against the price of gold on the international market, amounts to US$ 753.688 billion, despite the decline in the value of gold compared to the previous period. At current prices, since the policy was introduced over 50 years ago, the embargo has inflicted quantifiable damage of more than US$ 125.873 billion."